Tom, I didn't notice that you had copy and pasted, sorry for any confusion. LH/350 yes fewer problems with proper steering arms but the geometry still isn't the same, there is a 2 degree difference in KPI. I know there are plenty of Toranas getting around with HQ stubs but all my research has led me to believe that it is a sub-optimal solution. Most cars will experience some amount of bump steer so how much any individual is willing to put up with (and what is safe) may vary. 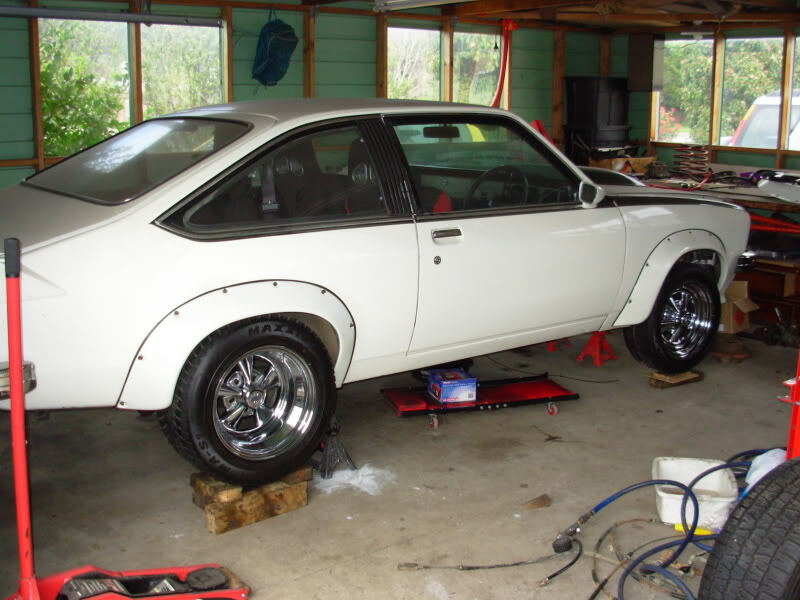 All I'm saying is that HQ stubs will make this worse than factory Torana, which seems like a strange thing to do on a performance vehicle in particular. By all means make your own decisions but at least make them informed ones. "Tom, I didn't notice that you had copy and pasted, sorry for any confusion." 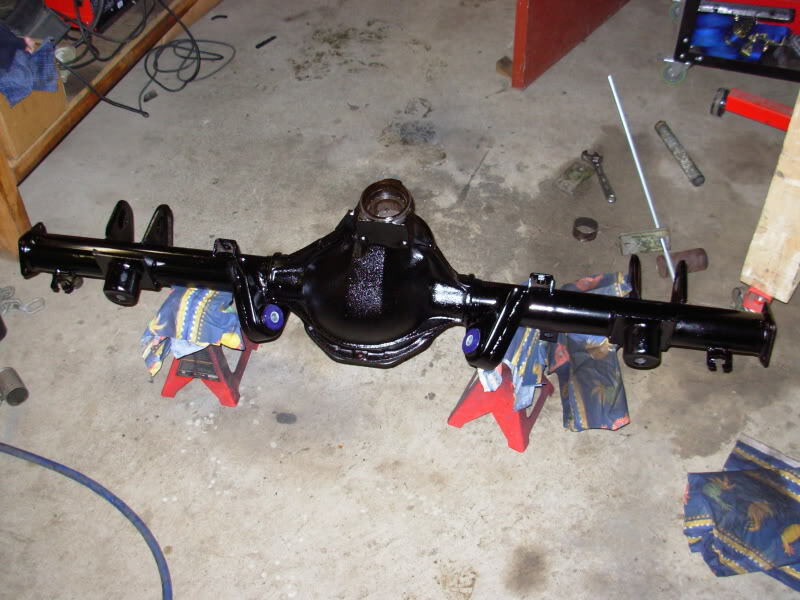 i thinks u are right unless we can get the a9x stubs no point..
weld steel brackets from the banjo diff onto the r31 cast diff with any guarantee it will all stay together?? with the vs..vt brakes ..if u had a bracket made up for the caliper is that still a problem? 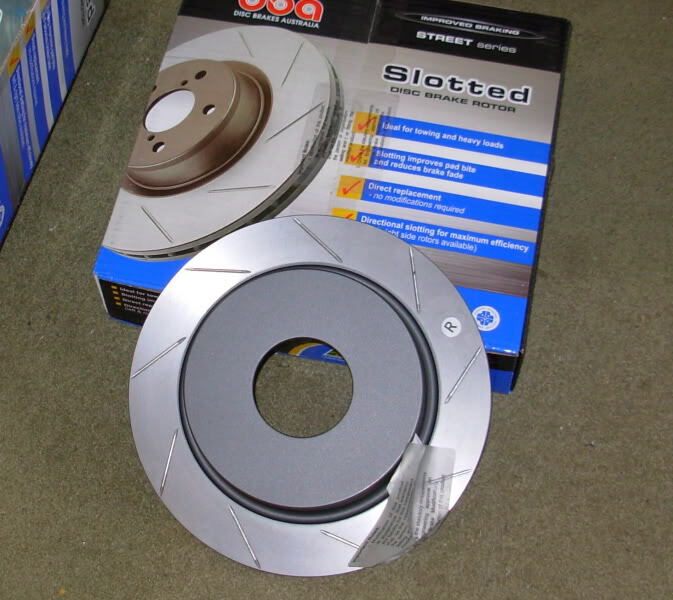 i like the idea of the vs disks with nissan 4 point calipers!! many thanks for your input..
Last edited by lxclone; 09-07-2008 at 04:03 PM. I had a supposed professional raise the same issue about welding to the cast diff centre but Rory put that one to rest - its cast steel, not cast iron! (Which is quite logical when you think about it and I don't know why professional welder/fitters can't tell the difference). Short story is there is no problem here. Are you talking about front or rear brakes? The only issue really is getting them to fit without clearance problems. Do a search on this site for 'MHDT' and you will find Rory's thread on his race car - lots of interesting info and some of those photos are on his photobucket account which has yet more interesting brake and diff shots. i was referring to the front brakes.. Wheels arrived this morning! 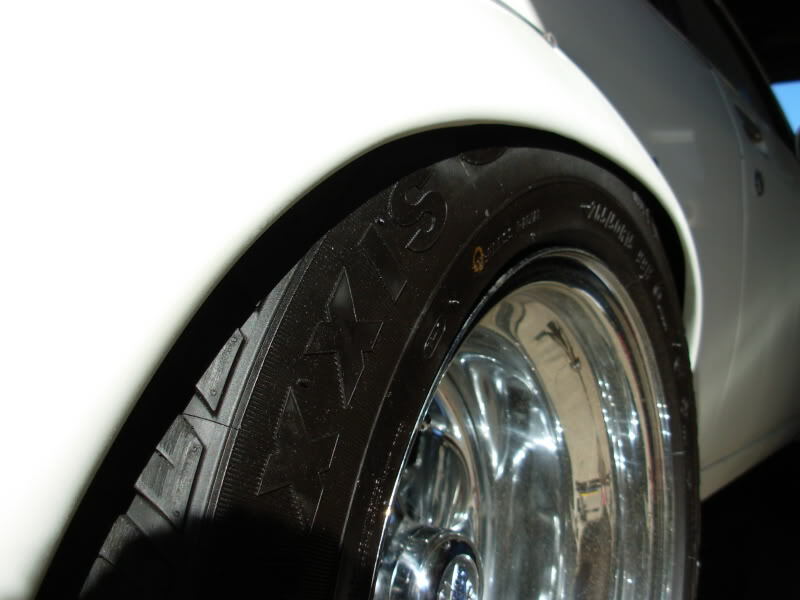 Rears are 15x10 with 295/50/15 tyres, fonts are 15x8 with 245/60/15 tyres. The rear tyres have cuts on the sidewalls due to rubbing which is a bit disappointing but I wasn't planning on using them anyway as they will be slightly too big. I will use the same 265/50/15s that I had before. Looks cool with the big tyres but not practical. There's no way the front tyres will fit at all, going to put a pair of 225/50/15s on them. Got the proper tyres fitted today, and bought some wheel nuts. 225/50/15 on front, 265/50/15 on rear. They look a lot better, and (hopefully) fit the car. The rear wheel is just sitting on blocks of wood, there is nothing behind it. The front one is hanging at full droop. I still haven't cleaned them but they look pretty good to me. The rear flare looks better than what was there before and gives me a little more clearance but still not quite the right shape. I've seen a number of hatches with a much more circular shape to the rear flares which I like better. I suspect that over the years some people have improved the design for their own purposes, probably the good looking ones aren't the factory design! Never mind, what I have will do for now. Last edited by 76lxhatch; 21-07-2017 at 09:31 AM. have u a picture from the back of the back tyers? I only have the one rear wheel in place, just tried taking a photo but its too dark to get a decent photo now. Would be good if I had a bigger garage! stress that credit card out on a shed!! Dummied up an old diff with the wheels sort of bolted on in the weekend to check guard clearances, sadly not looking good with the 10" wheels on the rear. Hunting around for a better set of flares which I hope might fix the problem and/or any other options which might help. If the worst comes to the worst I might have to go back to an 8" wheel which will pull the tyre further inward. Diff housing and axles are supposed to be done around this time next week! It clears and turns freely but the wheels are bolted straight to the axle flange - brakes add 3mm, then the new diff will add another 9 to 10mm! However all is not lost, I think I've found a supplier for better flares (I've had enough of these already and haven't even driven it with them on! ), which should add a bit of width. Might also look at getting the wheel offset modified if cheap enough to do, as that will fix everything, there's a good inch of room inside. Have also considered raising the car a little as it is very low, but not too keen on that. It looks so much better with the wider wheels, I'm determined to make them work somehow. Last edited by 76lxhatch; 21-07-2017 at 09:32 AM. Now for a three and a half week frenzy to get everything built and back together! Also drilled both rear discs and put the studs in one of the axles. Getting the studs to go into the fresh holes dead flat was more difficult than setting up and drilling the discs accurately! 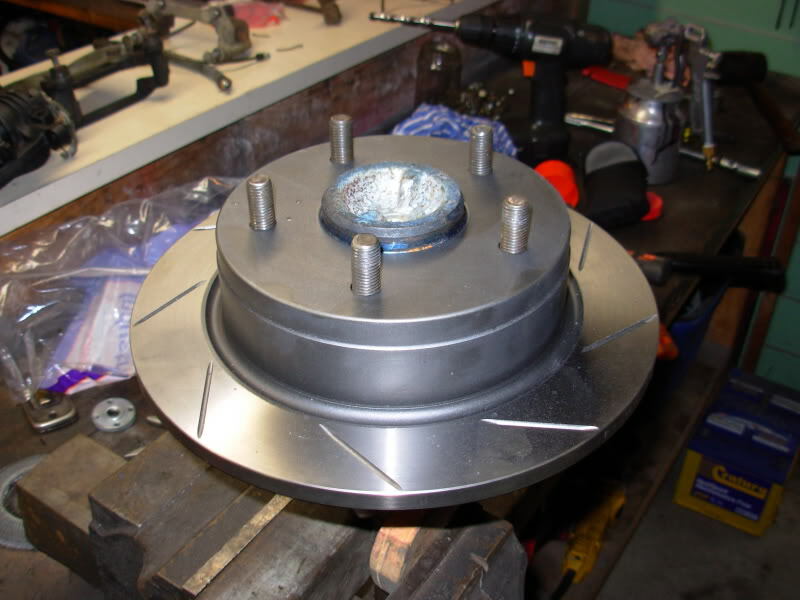 Just sat the axle in the disc (spigot locates it perfectly) and used the right size drill bit to start the holes, just making a small centre dimple, then drilled out with the drill press. Holes are quite tight at 12.5mm, might have to go out and buy a 13mm drill bit to make them easier to get on and off, the thick disc outer means you have to have it perfectly square. Sorry about the crummy photos, weather outside is awful and not much room in the garage.